The Soviet Union suffered heavy casualties throughout WWII, and much of this was due to poor aerial defense. The Red Army knew as early as 1942 that they needed to make a vehicle with such capabilities, especially in large numbers. Whilst some more heavily armed tanks were given AA guns in machine gun mounts, and there were reports of them knocking aircraft out, this was not sufficient and a specialized vehicle was needed. In fact, 6% of Soviet tank losses could be attributed to enemy aircraft, averaging 90 a month in 1944. It was clear that a new vehicle was needed. Soviet AA defense relied heavily on the quad-Maxim gun, which was sometimes mounted on GAZ trucks. 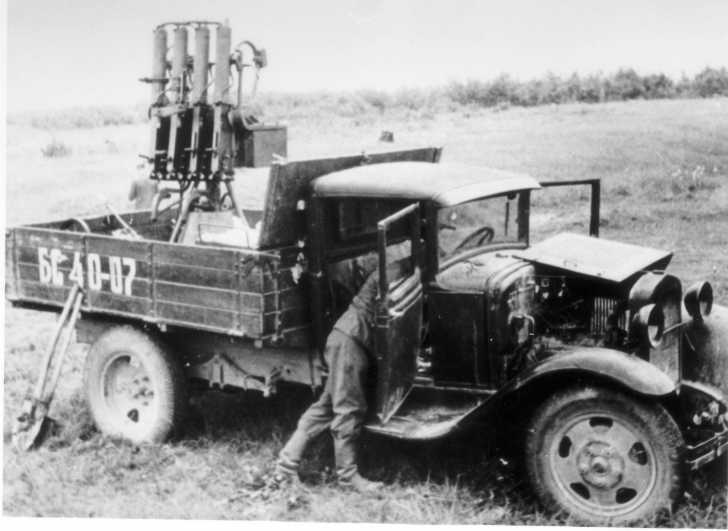 ZiS-42 25 mm (0.98 in) guns were mounted on similar trucks. However, there was a desire for an armored SPAAG. According to Zaloga, 6% of tank losses could be attributed to enemy aircraft, averaging 90 losses a month in 1944! 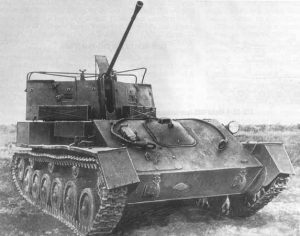 The first idea for a SPAAG armored vehicle came about in 1942, when a twin 12.7 mm (0.5 in) DShK machine gun turret with optical sights was built and could be mounted on the T-60. Later, the T-90 prototype (based on the T-70) was built, featuring a similar armament. 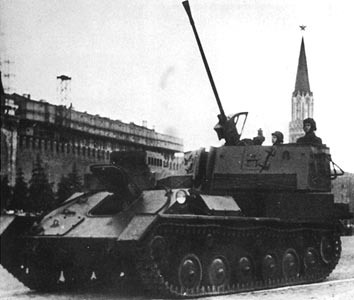 However, the program was canceled in 1943, in favor of the ZSU-37 self-propelled anti-aircraft gun, built on a SU-76 chassis. Zavod Number 37 was given the project. 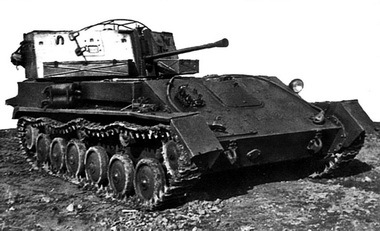 The first prototype used the original SU-76 chassis and had transmission problems, as well as turret traverse issues. After a redesign using the SU-76M hull, it was accepted for production in 1944. A ZSU-37 with its gun down at lowest elevation. The ZSU-37 was produced from 1944 to 1948, and 75 vehicles were built in total (only a few vehicles were produced before the war ended). It saw no service in WWII because the Luftwaffe did not send out missions in spring 1945. 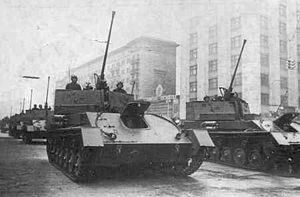 However, there was a self-propelled anti-aircraft artillery battalion equipped with 12 ZSU-37 SPAAGs by the end of 1945. After World War II it was decided that the low rate of fire and firepower of the 37 mm (1.46 in) AA gun was not effective against high-speed low-altitude targets. The anti-aircraft artillery crews discovered that it was very hard to manually track fast-moving targets due to the low turret traverse speed. SPAAGs built on a light tank chassis also had quite low maneuverability on more difficult terrain, low off-road speed and range in comparison with medium tanks and self-propelled guns (SPG)s, which the ZSU-37 was meant to protect during an aerial attack. The ZSU-37 was eventually retired because of the problems that it faced, and production was halted in favor of new projects. The ZSU-37 was given an open-top turret, armed with a 37 mm (1.46 in) 61-K mod. 1939 anti-aircraft autocannon. The vehicle was also given an automatic sight, a stereo rangefinder, a powerful radio, an advanced intercom system, and mechanical aiming mechanisms with two rates of angular motion for adequate speed and smoothness of aiming. This all greatly increased the vehicle’s capabilities because the commander would be able to quickly direct the crew, and the gunners would be able to effectively fire on the target, in theory. However, as stated, the sheer drawbacks of the chassis and turret system meant that it was simply a bad design. The crew consisted of six men: a driver, a gunner for azimuth, a gunner for elevation, a sight adjuster for target speed and range, a sight adjuster for target course and dive angle, and a loader. To protect the crew from rain and snow the gun compartment could be covered with tarpaulin. However, the gun could not be fully elevated when this was done. The open turret had advantages, such as a generally higher elevation angle, much better visibility for the gunners and no need for ventilation, which would have otherwise complicated production. Light and maneuverable, the ZSU-37 was considered quite an effective SPAAG in the mid-1940s (relatively speaking, as the USSR only had the T-90 prototype and SPAAG trucks to compare it to). However, it had fundamental drawbacks such as the turret, insufficient off-road capabilities to accompany medium and heavy tanks on difficult terrain, and this was its demise. A large column of ZSU-37s on parade. Ammunition consisted of 320 armor-piercing, fragmentation incendiary, and fragmentation rounds (all with tracers). 130 rounds were in 5-round cartridges, and 190 rounds were without cartridges. Armor-piercing composite rounds could, in theory, be used against enemy heavy tanks. Muzzle velocity was between 890 and 920 m/s, depending on projectile type; the armor-piercing shell weighed 0.785 kg, fragmentation shells weighed 0.732 kg. The autocannon could be raised and lowered between -5° and +85°. Practical rate of fire was about 50 to 60 rounds per minute. Maximum combat vertical fire was 2,500 m while the maximum vertical range was 6,500 m.
“Russian Tanks of World War II”, by Tim Bean and Will Fowler. 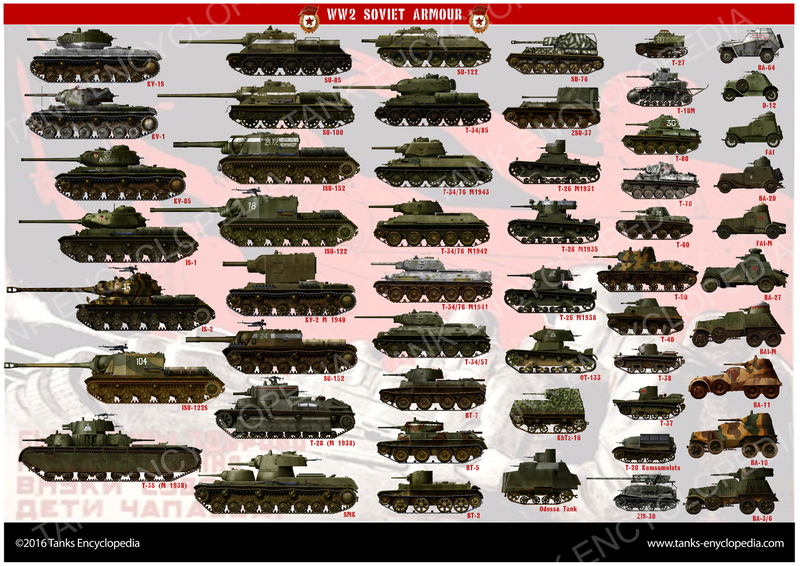 “Soviet Tanks and Combat Vehicles of World War II” by Steven J. Zaloga and James Grandsen. Fictional livery of a ZSU-37 in winter paint, winter 1945. A ZSU-37 in the Red Square during a parade. A ZSU-37 with the tarpaulin supports visible. ZSU-37 in the Red Square, Moscow. A truck with a quad-Maxim gun. This was previously one of the more common AA vehicles.